Dress trends toward business-casual, though you can find anything from jeans to suits. People are very friendly. Come prepared to receive a warm welcome. Sunday morning services begin at 9:45 a.m. We come together for 45 minutes of Bible learning in small groups called Sunday School. We learn about God’s Word and its application to all areas of life. Worship Service: Our service begins at 10:45 a.m. During this time, we sing songs, offer prayers to God, read Scripture, give tithes and offerings, and listen to the message from God’s word. Music: The music we sing at Orrs is mostly in the traditional style with some Southern Gospel and some contemporary music. Our choir sings regularly every Sunday morning. Sometimes we have special music. 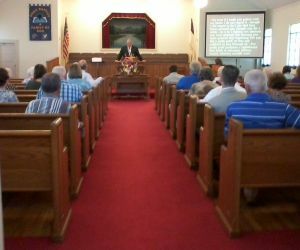 Sermons: Preaching at Orrs generally expounds on a particular Bible passage or subject. Sunday Morning Attendance is approximately 60 - 70 people. We strive to make our corporate gatherings accessible for every person who enters our doors. Handicap parking spaces are near the church doors. We also provide a ramp for easy walking and wheelchairs.